Need a Critique of Your Essay? 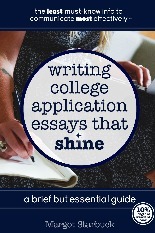 Interested in Margot reviewing your college application essay? Student has 7 days to submit a revised draft of the essay for review at no extra charge. Subsequent rounds of feedback, after student has implemented suggested changes, are half of original fee. ​Email wordmelon (@) gmail.com to connect with Margot! *Note: You'll get the most out of your critique if you've already peeked at the FREE Editing Checklist that can be downloaded HERE. Really, do it. Then have a friend or parent review your essay using the checklist. Your essay will be better. Are you the first student in the generations of your family to attend college? If so, Margot is already cheering you on in her heart. If you live in Durham NC, email wordmelon-at-gmail.com about how to receive a FREE essay critique. You can typically expect a critique on your essay within 3 days. RUSH SERVICE available for an additional fee.